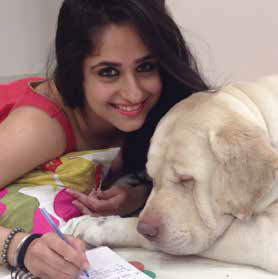 Hunar Hale, the smiling beauty of Indian television is loved by all and the secret of her happiness is unconditional love… for our four-legged furry friends. Dogs & Pups finds out more about this beautiful soul, who just loves to embrace pet parenting and enjoy and companionship communication with pooches. Hunar Hale is known for playing the lead role of Aditi Jaiswal in Chhal – Sheh Aur Maat and currently, she is playing the role of Nandini in Ek Boond Ishq on Life OK channel. 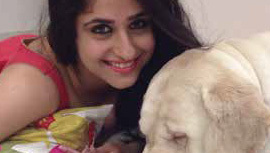 She first appeared on television with Star Plus show Kahaani Ghar Ghar Kii in 2007. After that she did Grihasti as Soni Khuraana and essayed the role of Ankita in Kehta Hai Dil Jee Le Zara on Sony India. Having so much fun growing up with furry angels, she couldn’t imagine her life without them, and sharing about her current pets, she explained that she has her homes in Delhi, Mumbai and Punjab and all homes have pets. The best part is that all pets at all houses are looked after by her family members. As soon as she visits any one of the homes, the pets stay with her. “I want to be surrounded by my loving pooches in all the places I belong. So I have pets at all my homes, including Mumbai, where I stay most. Whenever I am with my pets, I feel less burdened no matter what the situation is. They make me feel positive and all my negatives vanish,” she says. She is such a genuine dog lover that she asked us not to give any special importance to any of her pets, to her every pet is special in some or the other way. So, she purposely not mentioned the names and breeds of her dogs as she feels it’s all about love and nothing else. “I had so many pets over the years, of different breeds but one thing which is common to all is unconditional love. I am a difficult person to handle but my pets understand my emotions without saying anything,” she adds. Sharing one of her experiences, she said there was a time when she was completely heartbroken and depressed but she was behaving normally externally. “When I entered my room, my pet Beagle who otherwise was so noisy became mum and kept looking at me. When I sat on my bed, he sat next to me and started rubbing his body against me, as if he was saying don’t worry, everything would be just fine. This incident was truly amazing as it’s quite difficult to explain your condition to human beings but being animals, pets understand it without telling them,” she shares. On asking about outings and fun together, she shared that they go on regular walks on beaches but not on vacations. “In Mumbai, they are always in my car riding along. At times, they accompany me to my film locations, so they are aware of my routines,” she replies. Another thing she shared was that she loves to read a lot but the moment she wants to read something, her pets don’t like it as they feel that she is ignoring them. “The moment I pick up my reading glasses, they start barking and jumping all around. So I have to get extra pair of glasses and a nice pictorial book so that I can settle them first and I can enjoy my reading uninterrupted,” she shares. “I want to appeal to all who just love to give sweets to dogs to stop doing so as sugar is quite harmful to our furry angels. Although it’s a nice gesture to do so, but unknowingly we are harming them. If you really want to help them, feed them healthy stuff and most importantly save them from loud noises. Pets are so much scared of loud noises, so we should be sensitive about them during celebrations, especially during festivals like Diwali. I request everyone to stop using crackers as they not only harm our environment by creating air and noise pollution, but also harm our pooches,” concludes Hunar.